Puchong, 12 June: Nazri Aziz's tourism tax may well be good for the industry. Especially for Sarawak and Sabah, as claimed. So all the Tourism Minister needed to do was to convince the industry and the people that it is so. But Nazri, as we all know, can be so incapable of the easiest of tasks. 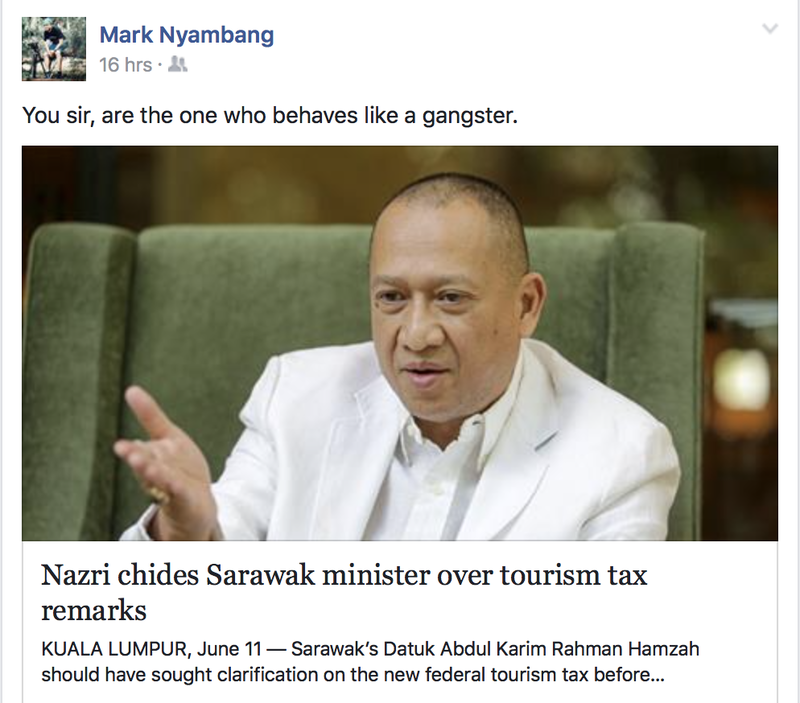 His belligerent response to the Sarawak Tourism Minister's request to defer the July 1 implementation of the tax is the latest example of this serious handicap. And it's going to haunt him, the Tourism Board, and last but not least, his boss the Prime Minister. Because the Sarawakians, sweet and friendly as they are, can be belligerent if you disrespect them. In fact, anyone would. 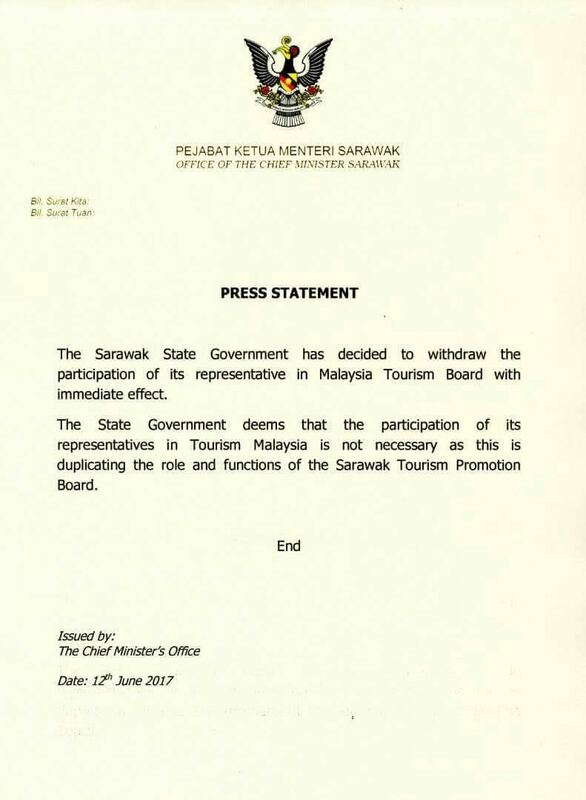 KUCHING: The state government has decided to withdraw Sarawak’s sole representative in the Malaysia Tourism Board with immediate effect. 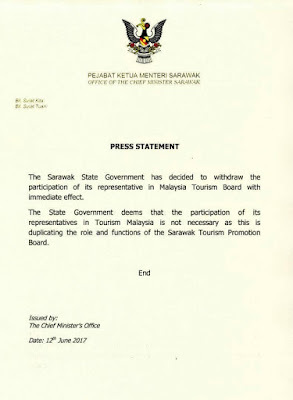 "The state government deems that the participation of its representative in Tourism Malaysia is not necessary, as (it duplicates) the role and functions of the Sarawak Tourism Board," the Chief Minister's Office said in a statement today. The abrupt move comes amidst a nasty spat between Tourism and Culture Minister Datuk Seri Nazri Aziz and Datuk Abdul Karim Rahman Hamzah, the state minister in charge of Tourism, over the new tourism tax. Nazri recently explained that collections from the new tax will be distributed to all states, including Sarawak. Nazri also labelled Karim “inexperienced” and a “young minister” for raising concerns over the tax, and reminded the latter that there are "bigger gangsters" than he. So out of the window the Federal government's RM654.62 million tax shall go, I reckon. Unless Nazri says sorry, I don't see how Sarawak would go along with the proposed measure. And then we can all imagine how the Sabahans will react. In the end, Najib Razak will have to step in, once again. Like he had to with FGV, in order to try and undo Isa Samad and Zakaria Arshad's mess. Like he is doing with Prasarana re the GLC's inability ti maintain and operate our public transit systems. In the end, Najib Razak will have to step in, once again. Like he had to with 1MDB and SRC, to manfully songlap billions into his own pockets. What a troubleshooter the Bugis pirate is. Ohhhhh by the way, "Eagle High Najib". The Bugis pirate is corrupt everywhere - including FELDA. See how he used his 1MDB stolen money in AmBank? The pre-election cash bonanzas included a RM100,000,000 cheque handed to ‘Pertubuhan Kebangsaan Malaya Bersatu (UMNO)’ 11th April 2013 a week after the election had been announced. On 22nd April UMNO Malaysia again received two further cheques of RM50 million each. Individual cheques were also handed out to all UMNO and related BN divisions, for example Badan Perhubungan UMNO Negeri Pahang received RM15 million on 18th April and the following day, April 19th, UMNO Penang received RM5 million. Kelantan division received RM5 million on 10th April. Amongst the many other similar payments was RM5 million both the UMNO state party of Kedah and the MCA Selangor Liason Committee on 8th April and RM20 million to UMNO Selangor on April 24th. UMNO Perak received its handout on April 29th of RM25 million with another five million each going to UMNO Selangor and the MCA Selangor Liason Committee again the following day. Also on 30th April Johor UMNO received RM25 million, less than a week before the election. The UMNO womens’ divisions also received significant pay outs, signifying the party’s appreciation of the importance of ‘winning’ the female vote: Pergerakan Puteri UMNO Malaysia received a RM5 million cheque 27th February and Pergerakan Wanita UMNO Selangor RM1.1 million 22nd March and Wanita Barisan Nasional Selangor RM1 million on 17th May. Allied parties also received big money, for example the Liberal Democratic Party received RM1 million 5th April, the Malaysian Indian Congress received RM10 million on the 18th April and a further RM5 million 26th April. SUPP received RM2 million 20th March. The previous year UPCO had received RM2 million, indeed over the election huge sums were dished out to Sabah and particularly Sarawak (of which more later). Since all this money came from stolen public funds, borrowed at punishing rates of interest under false pretenses, the ultimate cost to the Malaysian taxpayer will be at least double the sums handed out in this exercise to buy votes for the ruling party, who was abusing its position in such a spectacular fashion. People are entitled to assume that a man who is willing to raid his country’s development fund, as well as the civil servant pension fund, the pilgrims’ fund, the farmers’ fund and doubtless other sources of public money, is unlikely to hesitate to attempt to bribe voters with a little of that money back in the form of payment for votes. If Najib has to keep stepping in to every ego driven mistake, it does serve any purpose to gave Ministers and government representative Chairmen.